House mice are not native to the United States. These critters came over from Central Asia on ships. Like Norway and roof rats, they are termed commensal rodents. This is due to the fact that they require a close association with humans for their survival. They can be distinguished from field mice by their overall grey coat and smaller black eyes. Additionally, their tails are nearly hairless. The native Peromyscus mouse is deemed the better looking. Additionally house mice have a very distinct “mousey-odor”. These small rodents weigh around 0.5 ounce. Adults are 5-7 inches long, including a 3-4 inch tail. Breeding is rather prolific year round. Under ideal conditions, females can have 10 litters per year (approx. 50 offspring). Normally, females will have 4-6 litters of 5-7 young each year. Nests usually consist of a fibrous material- like finely shredded paper or grass. You can find them anywhere that humans inhabit. Outside, they can be found competing with native mice in grassy areas and grain fields. 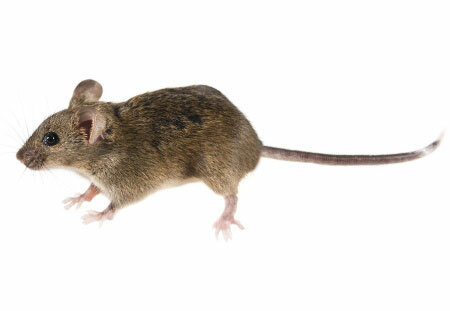 If you see a mouse during the day, it is most likely a house mouse. Even though they are primarily nocturnal, they can adapt their behavior to be active when we are not. House mice are nibblers that prefer cereal grains. Once inside, they are attracted to high calorie sweets and fatty foods. This fact is why mice are related so much to cheese. Likewise, that is why peanut butter works so well as trap bait. Deer mice are the most abundant and widely distributed mammal in North America. They can be found in nearly any kind of habitat- from forest to grasslands. This is a semi-commensal rodent. Thus, they are found primarily in semi-wooded suburban and rural areas. Deer mice and white-footed mice are not usually found in urban areas- unless the area is surrounded by fields or parks. 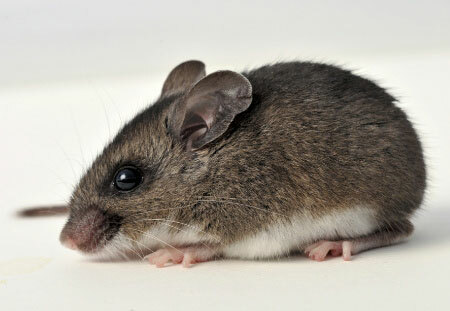 This mouse is nocturnal- spending the day in refuges or nests. Nests consist of twigs, stems, leaves, moss, milkweed silk, grass roots, fur and feathers. You’ll find most nests in cavities under roots, logs and boards. The Peromyscus species also nest in burrows made by other rodents. Their eyes are enlarged to help them navigate through their night-time activities. As their name implies, their body coloration is bi-colored like a deer. Fur is white on the undersides, legs and feet. Most importantly, the key identification feature is a sharp color line on the tail. This distinct line separates the brown top from the white underside. Although deer mice typically do not breed during winter, it is possible that a female can have up to 11 litters per year. A litter can range from 1-9 young. Litter size increases until around the 5th litter. After that litter sizes decline. Populations spike during the fall. Although they are active year round, native mice are capable of entering a period of dormancy during cold winter weather. They overwinter in family groups. Seeds nuts and acorns make up most of their diet. Other delectable morsels include: fungi, fruits, vegetation, and bugs. Interestingly enough, deer mice are the most carnivorous of the 3 species. They will feed on insects and even carrion. Our native species store food caches. House mice do not do so as much. Out of the 3 species, this one is the largest. They can weigh up to 1.5 ounces and grow to nearly 8 inches long with tail. Like the deer mouse, they are bi-colored and have big eyes. The difference in telling them apart is that they do not have the sharp color change line on their tails, and their eyes are closer together. Both species have a reddish- brown summer dominant color, and a grey winter tone to their coats. You’ll find these mice are more restricted to deciduous forests and brushy fields. They forage in adjacent fields, where they can eat up to 30% of their body weight per day. Their diet includes: acorns, beechnuts, hickory nuts, chestnuts, jewel weed, pine, and cherry seeds, grasses, mushrooms, corn, fruit, beetles, crickets, flies, snails, caterpillars, grasshoppers, road kill, and other carrion. Importantly they are predators of gypsy moth caterpillars. Their hunting characteristics are much like a cat; as they pounce on their prey. Expandable cheeks allow this rodent to gather and store large quantities of food in multiple locations. Quarts of seeds and nuts can be found inside their nests. For their size, their food caching ability rivals that of the red squirrel. This critter is semi-arboreal. Which means they feel right at home in trees. You’ll be hard pressed to find their well-hidden nests. Other common nesting sites include: basements, stumps, logs, abandoned nests of birds and squirrels, attics, chimneys, chipmunk and groundhog burrows. Breeding peaks in spring and again in fall. Females have 3-4 litters per year with 3-5 young per litter. Unlike the deer mouse, populations tend to remain constant throughout the year. Normally the gestation period lasts 21-23 days. Weaning occurs around 2-3 weeks, and they become sexually mature when they are about 2 months old. Rodents and their parasites can transmit a number of diseases. In our opinion, these are the most important health concerns when dealing with mice in our area. Watch out for this when dealing with any rodent infestation. Mice especially spread this type of contamination. These rodents are so common that the goverment allows a certain amount of hair and sometimes droppings in the food that we consume. When mice infest your kitchen, be sure to properly disinfect food preparation surfaces daily. Within urine, there is a protein that can cause an allergic reaction in some people. It is possible that this can trigger asthma in children. Lyme disease is caused by a bacteria, that is passed to humans from deer tick bites. The primary carriers of the Lyme disease bacterium are the deer ticks’ favorite hosts; the deer and the white-footed mouse. The bacteria travels through the blood and establishes itself in many body tissues. This infection can cause severe symptoms in humans. The first symptom is usually a rash that develops within 1-2 weeks at the spot of the bite. Lyme disease is more prevalent where large populations of their hosts exist. 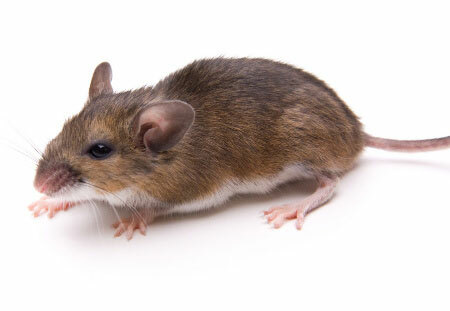 Deer mice pose an important health risk. Their contamination can carry the potentially deadly hantavirus. Infection is caused by the inhalation of virus contaminated particles from saliva, urine, feces, or nesting material. This disease is not vectored by commensal rodents (Norway rats and house mice). This disease causes serious respiratory illness in humans.